The first time I posted this photo January 2010. http://wildelifephotography.com/Events/Ice-on-Whyte/10974157_UWox8#767420771_C9sue I entered it in the Ice On Whyte photo contest and won second prize. 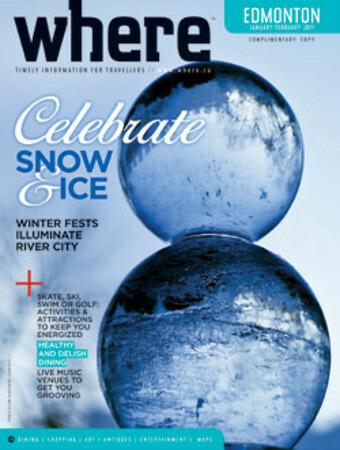 Last November I was approached by the Where Edmonton magazine http://www.where.ca/edmonton/ and asked if they could use this photo for the Jan/Feb cover. Feeling very honored, of course I said yes. I guess this is my 15 minutes of photography fame. wooo hooo! How exciting! Congratulations on a well deserved honor! Congratulations! It's fantastic that your work is getting some recognition. The cover looks terrific, by the way. wow...how fantastic is that! congrats!!!!!!!!!! Woo hoo! Big congrats! They made a great choice. What a sensational cover shot! Well congrats to you! It looks fantastic. I know you are proud!